It was about 9.20pm on Friday night. We were sitting on the couch, watching a tense semi final between Rafael Nadal and Grigor Dimitrov, having just polished off some homemade pizza and making steady progress on a bottle of wine. 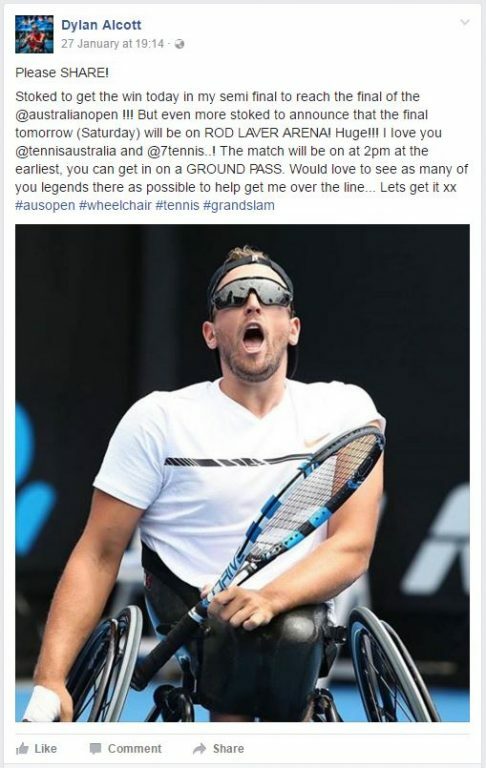 My wife turns to me and says, “Do you want to go to the wheelchair tennis?“. Sorry, what did you say? 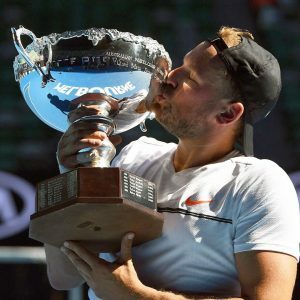 I first heard of Dylan Alcott when he started winning at tennis, but it was only when I heard him speak at an event at the MCG that I found out he was also a gold medalist in wheelchair basketball in the Beijing 2008 games. As a public speaker at the MCG that night, I found him engaging as he spoke about how he was born with a tumour wrapped around his spinal cord. In trying to remove the tumour in order to save his life, his spinal cord was damaged causing paraplegia and other complications including kidney failure. I also found him to be, well, bloody funny, as he told stories of how his brother used to tease him by putting the TV remote on top of the fridge! It was interesting to hear how the lack of any special treatment has helped mould him into the determined man he is now. This determination has contributed a pretty impressive tennis resume. Two Australian Opens and a US Open title, Paralympic gold in both singles and doubles. Also, he has been acknowledged by Tennis Australia with the Newcombe Medal and also the holder of an OAM. We arrived early for the Junior Girls final. It was an enthralling match which would not have looked out of place on the WTA tour. We googled the players so that we knew more about them as we watched them, so we could only laugh when 17-year-old runner-up Rebeka Makarova said to the winner Marta Kostyuk “What you’ve achieved is amazing, I mean you’re only 14 years old!” and the crowd let out a collective gasp in amazement that the tall, strong, and extremely skilled winner was of such a young age. One to keep an eye out for in future. The players were announced and it was just like the other Rod Laver Arena matches, as the big screens lit up with images of the players and their name in capitals scrolling around the court. But the first obvious difference to other matches on this court was the players wheeling themselves onto court while also pushing a second chair (I assume in case of a technical issue with the first chair? ), as well as carrying all their gear! As you might expect, I immediately started looking for the differences in this game as compared to able-bodied matches. Two bounces are permitted but often the players wouldn’t need it. The way players construct points by trying to move their opponent around the court is near identical to non-wheelchair matches, but the use of the drop shot/a softer shot, to mean that third bounce happens sooner, led to exciting points as the defending player would race from the baseline towards the net. Alcott was on top early, surging to a lead in the first set. There were elements of the contest that I found really interesting. The players would frequently be forced to take their eye off the ball in order to turn around and be ready for the next point. The level of coordination required to keep the rally going was immense. Speaking of coordination, the player’s coordination with their hands had to be supreme. You had to use your arms to propel the chair forward to chase the ball, in some cases also stop the chair and spin the chair to get extra momentum to hit the ball over the net, while also making contact with the ball using your racquet which you’ve been carrying all along. There were times where I thought there was no way the player would make the return, and they got there successfully. With a smaller crowd and slightly slower points, we were able to hear some funny comments which showed the character of the players. When Lapthorne hit a good shot, you’d hear Alcott go “Oh No!” and rush to chase down a ball. When Lapthorne challenged an out call on a serve, Alcott laughed at him. When Alcott hit a huge serve which Lapthorne didn’t return, he’d exclaim “Big serve!”, and when he won a game: “Come on Dylan!” pumping himself up at all times. Alcott led the first set 5-1, but despite having his serve broken to make it 5-2 he immediately broke back to win the set 6-2. In the second set Alcott quickly asserted his superiority but Lapthorne didn’t look out of it. When serving, the players would turn the wheel a touch to try to thrust their weight forward to give their serve an extra boost. Lapthorne’s serve, when it landed, was up to 120kph (comparable to the speed of the second serves in the junior girls game) and made it tough for Alcott. But Alcott was able to pounce on second serves and take control of points. There was an amazing point at 3-2 deuce where a long rally, spinning chairs, screaming by the players, and some cracking shots ended up setting Alcott on the course for the win and sent the crowd wild. It was a bit of a disappointing end to the match as Lapthorne served two double faults, giving Alcott a 6-2 6-2 win, and his third Australian Open singles title. Alcott caught the ball on the last point and posed for the big crowd of his fans in the north-east corner who were all cheering with joy. At the presentation, both players got emotional as they thanked the crowd for attending the first wheelchair match on centre court at a grand slam. Pat Rafter presented the trophy, and Dylan admitted having a poster of Pat up on his wall! He finished the presentation by declaring to his mates that the beers were on him that night!